Forgot I had this when I discovered Mephala's shrine, placed nicely in the Ascadian Isles. Curious as to which house mod this might be, I lowered myself in instinctively with levitate and acquired the staff without alerting the giant spiders. I had memorable experiences with the other shrines as well - specifically, the shrine to Hircine fit incredibly well with Winds of Sheogorad. The only problem is - I take the staff stand but it doesn't show up in my inventory. I haven't tested it with Weapon Rotate yet, but I hope it works with that mod because these things deserve to stand proudly in a stronghold. Yeah, that script to pick up the stands was leftover when I originally planned to do just that. But I'm not a very accomplished scripter and couldn't get it working after a night of messing around and just dropped the concept. But I'm glad you had a fun discovery with the Mephala shrine! I tried this and the staffs look really good. I encountered a little snag with my companion at the first staff I found. The Mephela shrine a little west of Suran will get companions stuck in the shrine if there's no way to teleport them out. I had saved as soon as I dropped down and it was too much progress on that save to revert to a much earlier save, so I had to look around for a way to teleport my companion from Partners mod out. I found that there's 2 mods which require MGSE that teleport any NPC's. Otherwise, the only workable solution I could find was to remove any staffs from the mod out of inventory, save, exit the game and uncheck the mod on the launcher. That sent my character to Fort Moonmoth exterior, and my companion was reset to the default location for that NPC in Partners mod. She was waiting there with all items and faction / quest progress intact. So, now I'll leave any NPC's parked outside the shrines. 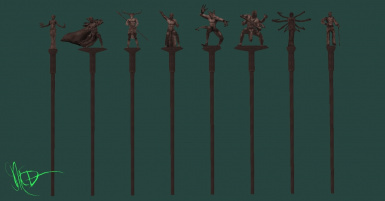 These staves work great for my monk and caster. Hey, thank you for the feedback, Aezrah. That's actually a relatively easy thing to fix. I'll upload a new file tonight. edit: alright, there's a new file uploaded now. Just a simple fix where I added some doors you can take back out with your companion. I've included several different tips for you to enjoy. Always happy to poke around with a friend. Woohoo! I hit the trifecta! *A little thing: I wish I was able to keep the staff stand so I could display the collection. That would be fun eh? I feel like I did think about doing that initially. I might check into it if it wouldn't be too hard. Thanks for the suggestion. And I am glad you enjoyed the mod! Lemme go check out that screenshot! Finally figured out how to approve those pictures. 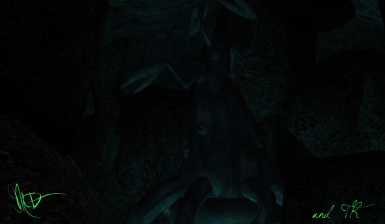 I'm glad you liked the shrine to Hircine! I actually forgot about that one. If I remember correctly there were some new beasties to fight against in there. Oh, and the Shrine to Mephala is a fun one too. Oh goodie! Mephala is very mysterious. If I was to do a quest mod involving the Deadra I would choose her. It would be horror themed with lots of spooky children. On a brighter note, I always thought that she and Azura should have a mud wrestling contest! Found Azura's staff and I am going to enchant it with soul trap and paralysis. Azura and Mephala mud wrestling... but Mephala has the advantage with additional limbs!